If Only Singaporeans Stopped to Think: Where does your donated blood go? Otherwise, most of the red blood cells collected are used within two weeks, said the HSA, though these cells can be kept for up to six weeks. Fresh frozen plasma can be stored at -35 deg C for up to a year, but platelets last five days at most. The need for blood in Singapore is growing, with demand expected to rise by 3 to 5 per cent yearly in tandem with the ageing population. But blood donors are getting older too. About 600 regulars stopped donating each year as they succumb to age-related illnesses themselves, according to the Red Cross. Compounding the problem is the shrinking pool of young donors. Donors aged 16 to 25 dropped by 13 per cent between 2012 and 2016, based on official statistics. Despite medical advancements, blood remains crucial in many operations and emergency situations. It is also a lifeline for people with blood diseases. In cardiac surgery, for example, transfusions are needed because patients are given blood thinners which make them more likely to bleed, said Assistant Professor Tan Teing Ee, who heads cardiothoracic surgery at the National Heart Centre Singapore. The blood thinners prevent clots from forming in the heart-lung machine, which temporarily takes over the function of the patient's heart and lungs during the operation. Surgery such as heart operations form the bulk of medical uses of blood here, at 54 per cent in 2016. General medicine is ranked second at 31 per cent. Examples are severe bleeding in the gastrointestinal tract and chemotherapy. About 9 per cent of blood is given to people with blood diseases, while the remaining 6 per cent is used for accidents and emergencies. Associate Professor Tien Sim Leng, who heads the Singapore General Hospital's (SGH) blood bank, said situations that call for a lot of donor blood are massive trauma from accidents, severe burns and injuries requiring major surgery. Such cases can "easily use up more than six units of blood" each time, he said. A unit is 250-300ml. Meanwhile, people with certain blood diseases need regular transfusions of red cells to stay well. These diseases include thalassaemia, aplastic anaemia and myelofibrosis. "The frequency of blood transfusion for such patients can vary from every few days to weekly, monthly or quarterly, depending on the patient's symptoms and haemoglobin level," said Prof Tien. Each transfusion is usually one or two blood units, sometimes three, added the senior consultant haematologist who is a blood transfusion specialist. Getting blood from donor to patient, however, is not as simple as collecting the blood and sending it straight to the hospital. There are many steps in between to ensure that each unit of blood is a safe match for the patient. Also, patients usually need only specific components of blood, that is, red blood cells, platelets or plasma. Extracting the platelets and plasma is done by directing blood into a machine, in a process called apheresis donation. Regardless of the mode of donation, all the collected blood gets separated into red cells, platelets and plasma at HSA. A small sample from each donor is also taken to be screened for at least five diseases, including HIV, hepatitis B and C, as well as syphilis. Last year, the Zika virus was added to the list. Ms Sally Lam, laboratory director of blood supply management at HSA, said it takes about 24 hours from the time of collection for blood to be made ready for use. In addition to the Outram blood bank, there are three other blood banks here - at Dhoby Ghaut, Woodlands and Westgate Tower in Jurong East. People can also give blood at community blood drives. The blood collected at all these locations is transported to HSA in cooler boxes. Ice packs placed inside the boxes cool the blood along the way, keeping the temperature at about 20-24 deg C .
Ms Lam said the blood labs operate round-the-clock seven days a week to provide a steady supply of blood and respond to emergencies. In 2016, nearly 1.3 million lab tests were done on about 372,000 blood components at HSA. For SGH, about 40 per cent of the blood units it receives each year are used by haematology and oncology patients, said Prof Tien. Among them is Mr Goh Chun Hui, 29, who has undergone "more than hundreds of blood transfusions". He was diagnosed with severe thalassaemia when he was three. His bone marrow cannot produce normal red blood cells, so he began going for blood transfusions every two months from the age of seven. The initial transfusions were "a terrifying experience", said the administrator in the real estate sector. "The doctors and nurses had to hold me down at the hospital as I was screaming in pain," he recalled. Over time, Mr Goh got used to the process, although the disease keeps him from strenuous activities. Said Mr Goh: "A lifesaver saves a person once, but the blood donors sustain my life on a regular basis and this enables me to move forward." Every drop of blood is precious, but they are not quite equal. Some blood types can be hard to come by. 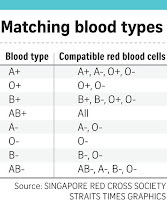 For every 1,000 people who give blood in Singapore, only one person carries the AB negative blood type (0.1 per cent). In general, donors with negative blood types are rare, forming only 1.5 per cent of the total pool in 2016. To keep some of these for a rainy day, the Health Sciences Authority's (HSA) blood services group deep-freezes the red cells of rare blood types at -80 deg C.
This way, the red cells' shelf life can be extended from the usual 42 days to 10 years, said Ms Sally Lam, laboratory director of blood supply management at HSA, which runs the national blood service. Otherwise, red cells are kept at 1 deg C to 6 deg C in fridges or cold rooms. Platelets are kept at 20 deg C to 24 deg C in large incubators with trays that gently rock back and forth, for up to five days. Ms Lam explained that platelets need to be "agitated" constantly, or they would clump up. Plasma is quick-frozen and refrigerated at -35 deg C for up to a year. Only blood that gets the all-clear after laboratory tests are stored, said HSA. Blood that is unsuitable for use will be disposed of properly. The rejection rate is low - less than 3 per cent to 4 per cent of all donated blood components. Some reasons for rejection include a positive result for an infection or that the plasma was too fatty. Donors can also ask the HSA to retract their blood through a 24-hour call line. They do not have to give a reason for making such a request. At hospitals, there are measures to ensure blood products are used properly and wastage is minimised. 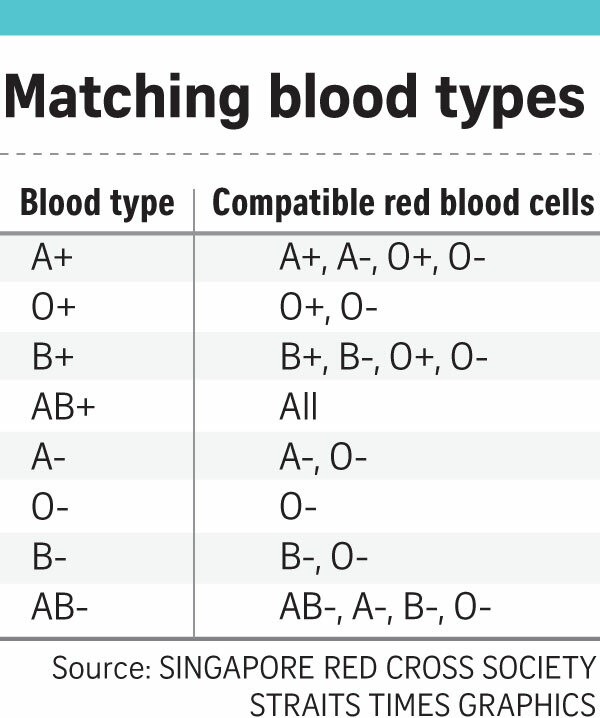 Singapore General Hospital, for instance, has a guideline on the number of blood units required for each specific procedure, said Associate Professor Tien Sim Leng, who heads the hospital's blood bank. "To minimise wastage, blood is issued only when the patient is in the operating theatre and needs blood." 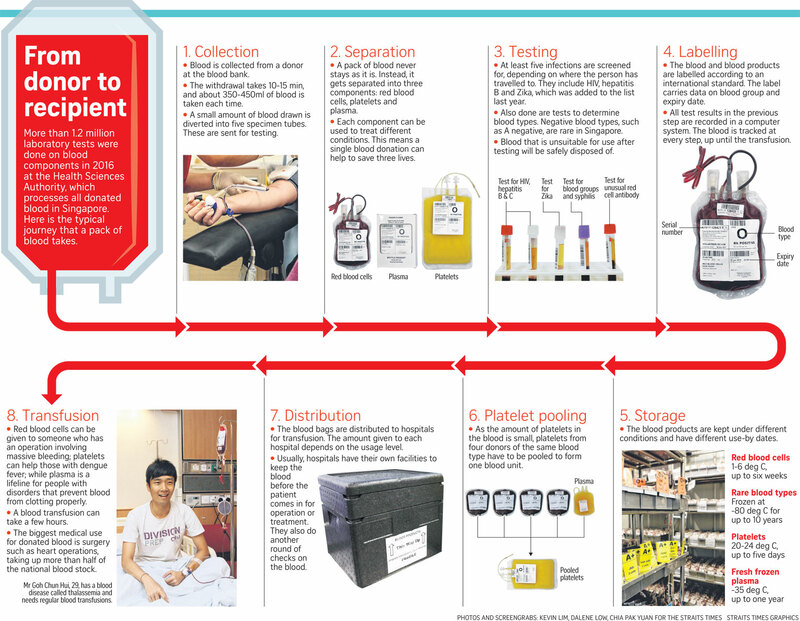 Medical institutions such as those under the SingHealth group, which includes National Heart Centre Singapore (NHCS), also have a committee overseeing blood transfusion. Assistant Professor Tan Teing Ee, director of NHCS' cardiothoracic surgery intensive care unit, added that blood transported to the operating theatre is kept in fridges there and "will not be taken out unless it is meant to be used". "If the blood product is out of the refrigerator for too long, it cannot be returned and thus has to be discarded," he explained. If the blood in the refrigerator remains untouched after an operation, it will be transported back to HSA to be crossmatched to other patients. "We try to minimise the use of blood products in surgical procedures... as blood transfusion carries risks," Prof Tan added. Taking supplements and stopping blood-thinning medication before surgery are some ways to help to reduce patients' need for transfusions. Prof Tan noted that expired blood, unfortunately, has to be thrown away. "This is sometimes unavoidable on days when there is more donor blood than what is required."